With a new year comes a new set of home design trends that will shape interior design for the next 12 months. Elliotts Living Spaces designer, Victoria Anderson, has been looking at some of the key trends that will be dominating our kitchens and bathrooms in 2019. Dulux has announced Spiced Honey as their colour of the year and I believe that 2019 will see people opting for warmer colour palettes. This sophisticated shade will help bring a more positive and cosy atmosphere to social spaces. While sleek lines will continue to be popular, I think we’ll see a shift towards edgier bathrooms in 2019. Barely-there shower cubicles will be replaced by black-framed enclosures, based on steel-framed Crittall windows. This simple design creates a sleek look with a nod toward industrial styling. 2018 was dominated by metallic accents and this will continue into 2019, with copper remaining popular. Taps and handles in copper, mixed with paired down contemporary furniture or classic marble, create a luxe feel. 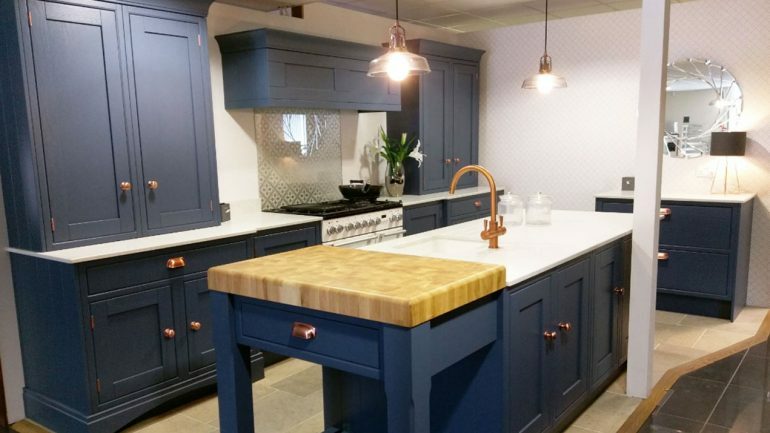 This Laura Ashley kitchen (pictured below), with copper handles and a Franke copper tap, at our Lymington showroom captures the trend well. Brass will also be a colour to watch out for in 2019. Looking to create your perfect living space in 2019? Get inspired at your local Elliotts Living Spaces showroom in Fareham, Lymington, Ringwood or Romsey and enjoy a free design service. Victoria is based at our Lymington showroom on Ampress Park.